This is it! 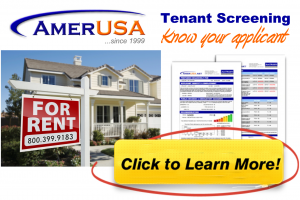 – The consumer credit report is the single, most universally utilized tool to screen a tenant anywhere in the United States. In fact, the overwhelming majority of creditors in general (e.g. banks, lenders, credit card companies, landlords, etc.) use one every time someone applies. So in case you’re like most people and haven’t been regularly monitoring your personal credit report – and you’ve kept getting turned down or getting the highest interest rate anytime you apply for something, then you need to find out what’s on your credit report today! That’s right – there’s no reason to wait! In fact, the longer you wait (for those that have bad credit), the longer you will continue to be penalized for something that may very well be reversible. Log on to any computer connected to the internet and get your free copy within seconds – there are no gimmicks or costly subscriptions to derail you from exercising your right under the U.S. FACT Act, in order to find out exactly what’s on your credit report without having to pay a dime. Visit: www.AnnualCreditReport.com to see exactly what information is being reported about you from all three of the major credit bureaus: Equifax, Experian and TransUnion. You should plan on doing this annually – both for your own protection and benefit. Not only will you be able to see unauthorized accounts or inquiries made by identity thieves, but you’ll also know whether or not your creditors are accurately reporting information about your financial obligations and their respective payment histories. There are many ways to approach repairing your credit report; just a few have been highlighted on the next two pages. For a more in-depth analysis and step-by-step instructions on how to repair your credit – and essentially beat the system – check out the American Credit Repair volume in the “Everything You Need to Know…” series. American Credit Repair is the ultimate “one-stop, do-it-yourself” credit repair guide, completely equipped with sets of forms, letters and more on an accompanying CD-ROM. Don’t bother hiring dubious credit repair companies when the law allows you to take care of your own business without wasting anymore of your hard earned money.